According to Taoist cosmological thought the foundation of all life is the movement and generation of energy or chi 尺 (‘ki’, in Japanese), without this quality stagnation occurs and nothing can exist to procreate, evolve or flourish. Taoism as a philosophy profoundly penetrated into the fabric of Chinese thought and was also to deeply influence both Buddhism and Confucianism; all three of these great systems were influential in Japan. In Taoist terms universal energy is generated by the interaction of yang and yin (J. yõ and in), usually expressed as ‘high and low’, ‘male and female’, ‘hot and cold’ etc), their interaction is a process of constant transmutation of the one state into the other, They are not ‘pure’ elements in the relative sense as the one contains the seed of the other, the one being defined by the other, thus they exist as a whole. The result of their interaction is the generation of chi. This energy can only be grasped by an absolute identification with the object, to the point where the subject (the observer) and the object (the observed) fuse, or, more correctly are seen in a state devoid of a relativistic perception. The painters were seeking after more than a representational truth of that which they were seeing. As the painter Ching Hao (c. 855-915) put it, “One should not take outward beauty for reality. He who does not understand this mystery will not obtain truth, even though his pictures may contain likeness.” In this sentiment there is no difference between what the painters sought after and that which the garden creators pursued, both are seeking the exact same essence. The Chinese landscape paintings that the Japanese collected so avidly may be meticulously composed, yet to the eye they can appear as wildly sensual creations. The mountains thrust up towards the heavens, with rivers running as torrents cutting ravine-like folds through the mountains. They are not always gentile, tranquil or bucolic depictions of landscapes. They are at times ravenous in their writhing energy, mysterious and even forbidding places, perhaps fit only for contemplation, the abode of birds and hermits seeking isolation. These are awesome, inspiring places. To some extent the paintings were modelled after actual landscapes, one only has to get the merest glance of the Huangshan mountains in Anhui Province to realise the paintings are not wholly imaginative dream-like landscapes. There are several other mountain areas scattered across China with similar characteristics. In such elemental conditions man recognises his place in the world, that of being part of the world, not the dominant controlling force he becomes with the power of technology at his disposal. In such landscapes the landscape is like a mirror held in front of us reflecting back an picture of mankind as part of nature; as much as a tiny spider, an eagle or a tiger. 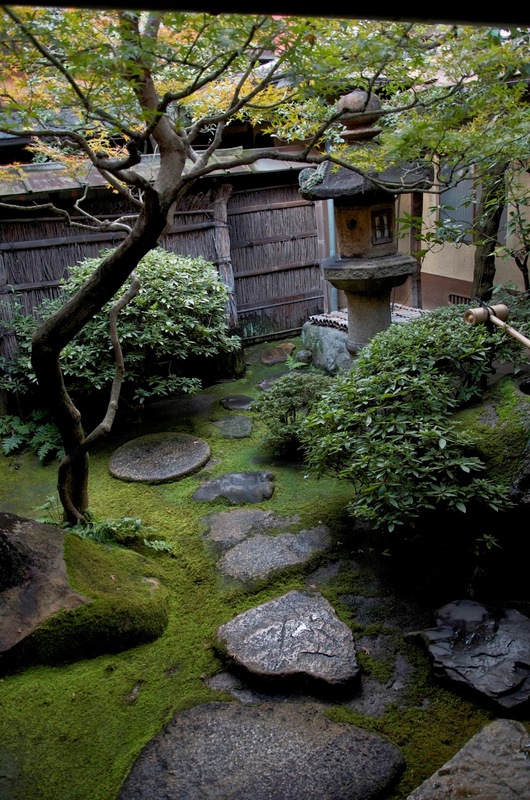 “Shōtoku no sansui "(生得の山水): this most evocative phrase, from the eleventh-century text Sakuteiki (作庭記) cuts to the heart of the approach that the garden creator takes to the work. It may be translated as; “the garden should always follow after Nature”. 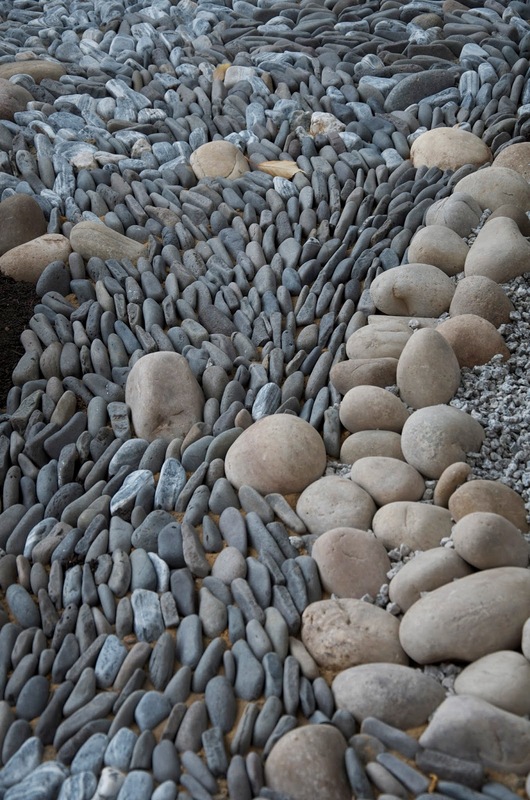 It is a reminder that the ultimate source of inspiration to the garden creator and the artist is Nature itself. Nature is a process in constant evolution, cyclical and nuanced in its movements. The paintings reflect this as much as the gardens, whereas the painters very often would use the effect of clouds to indicate season, the garden creator uses plants to gain the same effect. Each season brings its own emotional weight and quality to a composition, be it a garden or a painting, the lightness and renewal of spring, the coming into fullness of summer, the turning inwards of autumn and the withdrawal of energy into the earth for winter, are all part of the cyclical process we know as being life itself. That nature reflects so clearly the human condition meant that both painters and garden creators could imply symbolic values and moral conditions in landscapes being depicted. The painters were long used to seeing such values in the landscapes they depicted, and garden creators no doubt absorbed this from them however subconsciously. Specific plants held specific values, for example, the plum representing fortitude, the pine steadfastness and longevity, and bamboo resilience. These three plants in particular are frequently depicted in paintings, and together they were known as the ‘Three Friends of Winter’. 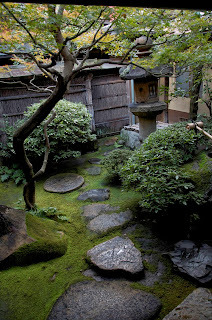 When we look at a garden such as Ryõan-ji , what we are actually looking at is a courtyard with fifteen stones scattered through a bed of raked gravel. Yet when we ‘see’ Ryõan-ji and recognise its essential spirit, then our imagination leaps to re-create an entirely different scene. We can now imagine mountain peaks projecting above a cloud base filling the valleys, we can feel ourselves observing islands in a seascape. Or we can simply sit there and be held in thrall of being immersed in something so much greater than our self. A landscape is so much physically greater in scale than the human body, in comparison we shrink in scale as if we had become a perceiving cell relative to the whole body complex. Part of the sense of awe we may experience comes through the recognition of no longer being the dominant element in the world we perceive. We find ourselves identifying with something other than the simple evidence of our eyes, because we have become an integral element of that landscape spirit captured before us. The garden is no longer outside of ourselves but an extension of our self. 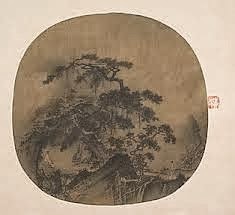 When one looks at the writings of Chinese painters and critics the term ‘harmony’ (Ch. 和 hé) arises frequently as a condition or quality that is desirable in a painting. Harmony is not a condition of stasis, but a dynamic, interactive condition of identification and alignment, a dance where the perceiver and the perceived are bound by reciprocal becoming. 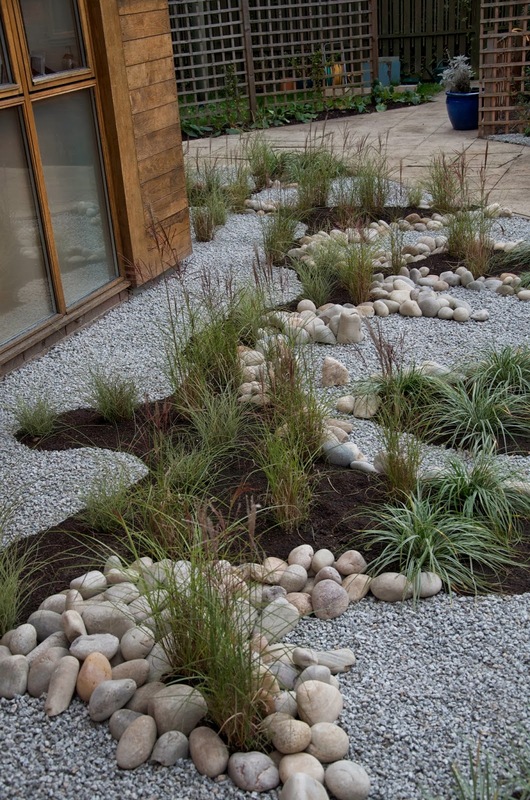 This is also a quality that is very much in evidence when one experiences a Japanese garden, indeed it is one of the most endearing characteristics of this garden form. What this reveals is that it is necessary for the painter and the garden creator to carry this quality within themselves, if it is going to be expressed within the work. Our ‘inner state’ is as important to the way the work will be perceived as the technique applied to its creation. 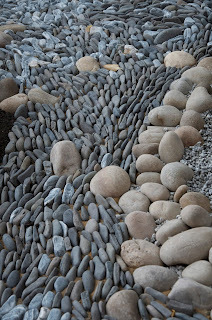 All that is brought to the process of creation remains as part of the work and reflects back in some subtle way. In this sense it is pertinent that the painter or garden creator be aware of his or her own ‘inner state’, as the garden, likewise the painting, is ultimately a reflection of not simply the materials used in its composition, nor the technique by which they are brought together. What the viewer receives is the totality of all the energies implanted into the work. Chinese landscape paintings have undoubtedly influenced and aided the development of the Japanese garden tradition pushing it beyond mere representation to become an art form in its own right. There were many factors that have gone into the development of the gardens, but perhaps it was the absorption of concepts from the paintings that pushed the gardens into the position they were able to achieve. Without the stimulus of the garden creators looking at the paintings, the gardens would likely have remained more mundane creations. Of course one can identify several other important influences, poetry, climate, geography, and cultural inclination for example but in terms of the gardens that we are able to look back on through a historical perspective, the landscape paintings hanging in dimly lit temple complexes and the residences of the ruling elite were probably the most important and complete factors of all. Merleau Ponty. The Phenomenology of Perception. Routledge, 1962.